or a Grand Prix hydro running at speeds up to 170 MPH. So, on Friday we got to see a little bit of testing, but not much. Testing kept getting delayed due to the water conditions, only a little bit occured. 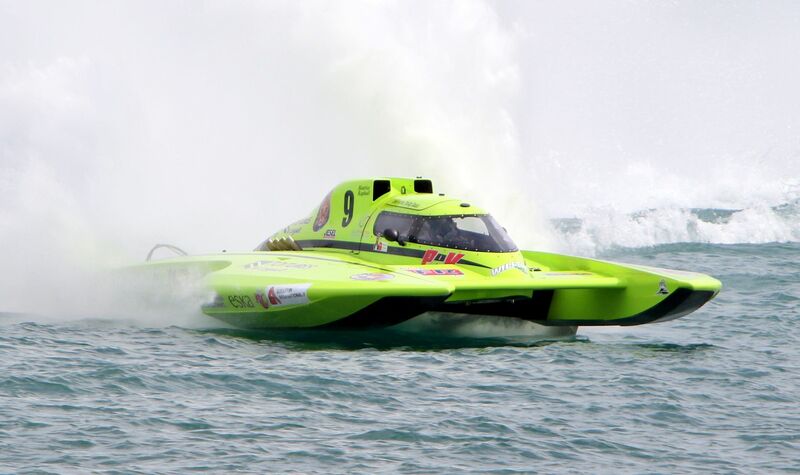 Finally, at 5:00, it was deemed calm enough to actually have qualifying for the Unlimited Hydros. 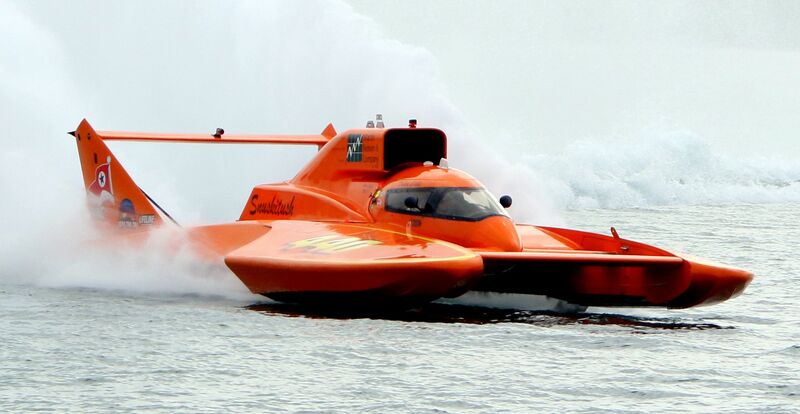 Jimmy Shane, in the new Home Street Bank boat, topped qualifying with a two lap average of 162.256 MPH. Second was Andrew Tate in the Delta Real Track boat at 157.636. So, not one test or heat race on Saturday, everything was moved to Sunday. Sunday was going to be a very busy day if Mother Nature cooperated. The forecast looked good at least, better than any of the days earlier. But, where Sunday had originally been scheduled to begin with Unlimited testing at 8:30, and the Unlimiteds first heat at 12:45, they now moved up testing to 7:10 AM. And, the first unlimited heat moved from Saturday was rescheduled for 9:00 Sunday morning. 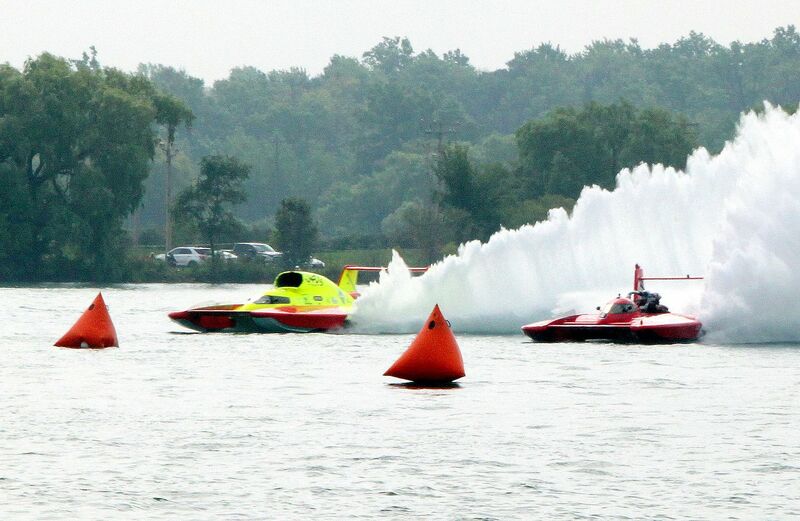 The new plan was to try and get in the Grand Prix heats from Saturday, all of the Unlimited heats from Saturday, and the Vintage heats from Saturday; all before the regular starting time of noon Sunday for the opening ceremonies. And, they almost did. They did have to scale back some of Saturday's schedule, but none of the Unlimited heats were cancelled. All four moved from Saturday did occur on Sunday morning. Impressive, but it didn't leave much time on Sunday for anybody to catch their breath. The teams were jumping all day. The Vintage Unlimiteds also ran their heats on Sunday. As did the Grand Prix's. It is amazing to me every time I watch the Unlimited's race. That they will hang these boats out at speeds in the straightaways around 200 MPH, flying them on the prop and turnfin. And do similar in the corners, flying the boats with next to nothing in the water or laying them on their sides close to losing the turn fin contact with the water, at speeds in the 140's, always creates moments when I have to catch my breath. Here are a couple of those times, more will follow as I get through the pics. As you may be able to tell from the above pics, the championship contest in Unlimited was between Jimmy Shane in Homestreet and Andrew Tate in Delta/Realtrack. Jimmy is the defending champion from last year's Gold Cup, the number one qualifier from Friday, and the National Champion from last season. Andrew is the runnerup to Jimmy from last season's Gold Cup, the number two qualifier to Jimmy on Friday, and the runnerup to Jimmy in last year's national championship, (the leader this year). Also, for additional motivation, Andrew's father Mark won the Gold Cup twice, in 1991 and 1994. If Andrew could win, it would be the first father/son name ever on the Gold Cup, the oldest trophy in all of motorsports at 102 years. Plus, Andrew is from Walled Lake Michigan, so a home crowd favorite. Andrew nailed the mill time and got the all important inside lane. Even though Jimmy got past him one time after the start, Andrew got the lead back and never relinquished it the rest of the way. Congrats on some awesome driving!!! He definitely hung the boat out to take the win. 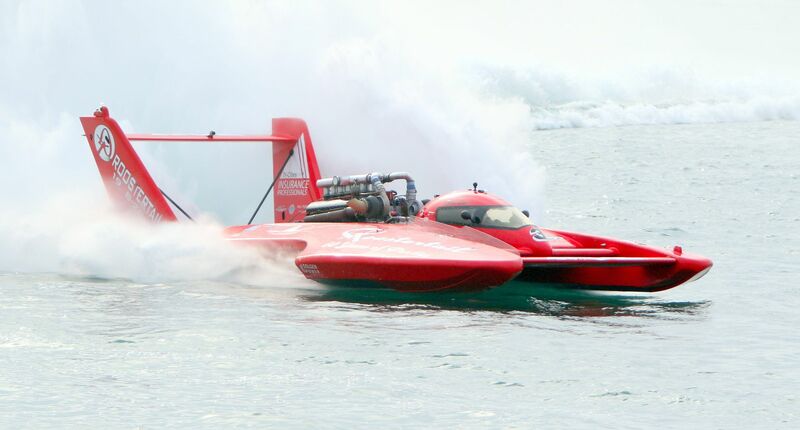 Plus, it clinched the season championship for him with one race left, San Diego's Bayfair September 14th to 16th. 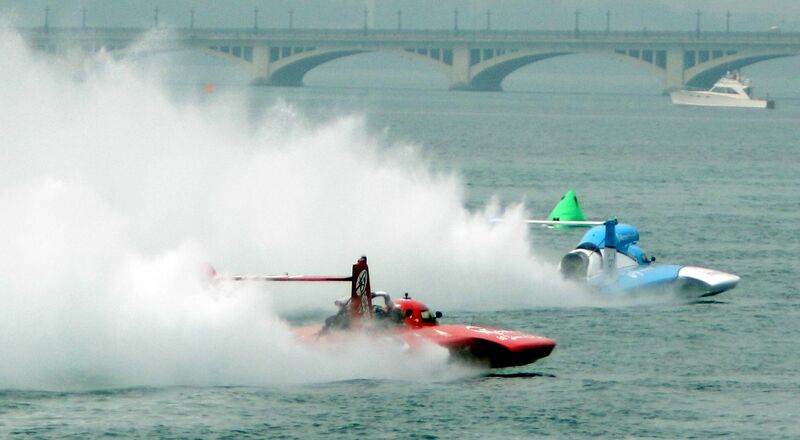 Sunday was a great day to be at the Detroit Hydrofest, Friday and Saturday not so much. But, when Mother Nature finally decided to take a break from a nasty mood, the people in charge of the event certainly came through. Congratulations to the organizers, the teams, and the fans. Outstanding event. Out of shape at around 200.